Love Sophia, but wish it wasn’t the #1 name in the US? Intrigued by Seraphina, but worried you’ll feel like a Garner-Affleck copycat? Here’s a possibility worth considering. 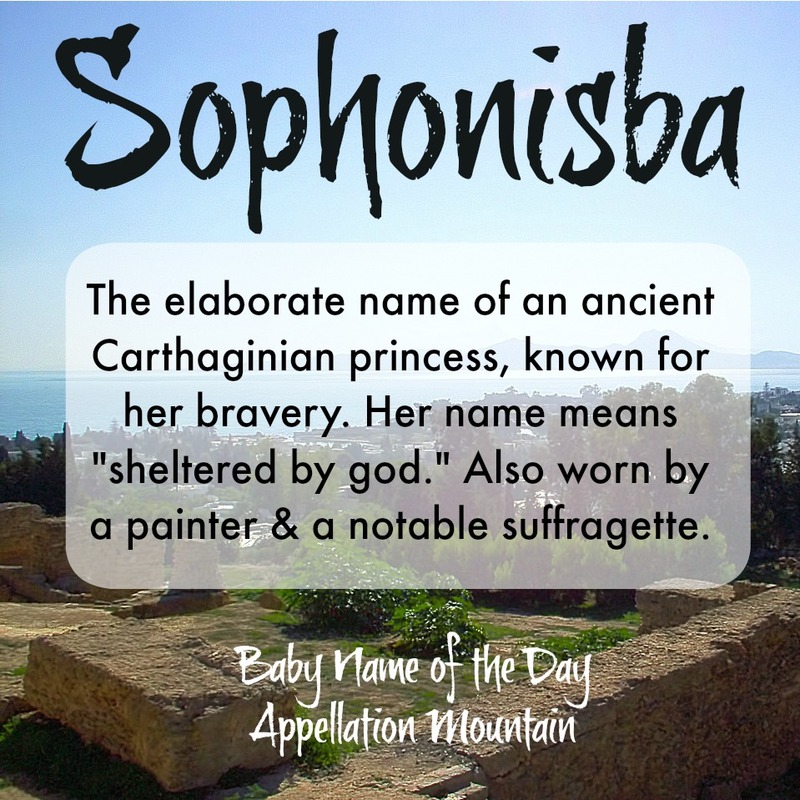 Thanks to WF for suggesting Sophonisba as our Baby Name of the Day. With names like Olivia and Isabella in the US Top Ten, you can’t really argue that Sophonisba is too long. It’s just four syllables: sah fon EES bah. Say it five times, and it starts to sound comfortable – and rather attractive, too. The story behind Sophonisba was once widely told – right up there with Cleopatra. She was a Carthaginian noblewoman, the daughter of Hasdrubal. The princess had it all – youth, good looks, and a dynastic marriage to a husband who loved her. It was the Second Punic War. Sophonisba’s engagement had already been broken once as battles were won and lost and alliances shifted. 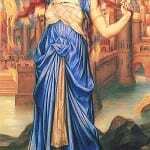 Sometime around 200 BC, Sophonisba and King Massinissa of Numidia were married. And that’s where it all went whopper-jawed. Massinissa was an ally of Rome. Rome, under the command of Scipio, had just defeated Sophonisba’s dad and her former betrothed. Custom dictated that the princess of the defeated be sent to Rome to appear in the triumphal parade, subject to the jeers of the Roman populace. What to do? 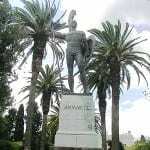 Massinissa feared losing his ally. And so, he offered his bride the option of humiliation or suicide, in the form of cup of poison. Sophonisba drank, and her legend was assured. There are many accounts of the story amongst the ancients, and she would be a favorite for centuries. Petrarch wrote about her in the fourteenth century. It was perfect subject matter for opera and art. As for her name, the original was probably Saphanba’al – sheltered by Ba’al, or God – though Sophonisba lived two hundred years BC, so her god was decidedly pre-Christian. And yet, it reminds me of Elizabeth, phrases meant to protect their bearers and glorify their beliefs. Sofonisba Anguissola, a Renaissance painter born in 1532. Anguissola met with considerable success, despite the limitations on women in her era. Her parents named her after the Carthaginian princess, and her sisters included Minerva and Europa. Daring names, those Anguissolas! She spent many years in the Spanish court. Sophonisba Breckinridge was an activist, born to a family of reformers. Born in 1866, Breckinridge graduated from Wellesley College, and went on to complete her legal training and become the first woman admitted to the Kentucky bar. She later earned her PhD at the University of Chicago and became an instructor and administrator at the university. Breckinridge worked on issues ranging from suffrage to civil rights to labor reform. It’s the name of a queen in ER Eddison’s 1922 fantasy novel The Worm Ouroboros. There’s only one conclusion to draw about this name: it’s strong and complex. The women who have worn it are admirable, from the ancient princess who chose death over dishonor, to the Renaissance painter and nineteenth century reformer who challenged gender roles and achieved much in their professional lives. But even at a moment where we’ve embraced long names, Sophonisba is a toughie. We’ve neglected the story of the original figure – and what kindergartener wants to explain that she was named for an ancient princess who died too young? Still, with the possibility of answering to Sophie, Sophonisba deserves a place in the everyday-nickname, super-surprising-formal-name Hall of Fame. 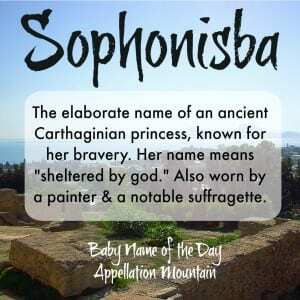 If you’re a truly daring namer, Sophonisba is one to consider. What do you think of Sophonisba? Too much name to consider? Or an ancient name ready for consideration in 2015? This was a great post and also caused me to research how far ba’al worship went westwards, interesting. For some reason I feel uncomfortable with a name referencing ba’al but I am fine with the Greek pantheon such as Persephone and calliope. Wanted to point out that 200bc predates Christ but is very much contemporary (later than many) with Old Testament characters and so would still have Christian sensibilities. In all I’d be happy to see sophonisbe but wouldn’t use her myself (and would prefer the historic to the invented Sophina). It reminds me of names like Balthazar. Which has the same meaning. The University of Chicago currently houses undergraduate students in Breckinridge House, named after Sophonisba Breckinridge, where students celebrate “Sophie Day” in the early spring. It appears that Sophonisba Breckingridge went by “Sophie” Breckinridge. She is mentioned in at least two scholarly books, where she is referred to as Sophie Breckinridge. Her name is also given as Sophonisba Ann Breckinridge. Her paternal grandmother’s name was Ann Sophonisba. I found a few other 18th – 19th century Sophonisbas online. The earliest birth of a baby named Sophonisba that I came across was in 1784 in Virginia. It seems that this name was most favored by prominent southern families, like that of Sophonisba Breckinridge. Born in Lexington, Kentucky, Sophonisba Preston Breckinridge was a member of the political active and social elite Desha family and Breckinridge family. She was the daughter of Issa Desha Breckinridge who was the second wife of Col. William C.P. Breckinridge, a member of Congress from Kentucky, editor and a lawyer. Her grandfather was the abolitionist minister Robert Jefferson Breckinridge. Her older sister was named Eleanor “Ella” and her younger sister, Mary Curry. Abby, thanks for profiling this interesting name. For those who think that this name is to unweildly to use, just type the name into facebook search. I did, it came up with at least 10 or more people for each spelling: Sofonisba and Sophonisba. I’ll have you know, One lady informed me that she was named Sophonisba, after her great-grandmother-who was named after her grandmother,who named after her grandmother, who named after her Mother’s sister, awho happened to have been a great care giver and mother to their family since they lost their parents at young age. So for her family, it was meaningful, not a daring choice. In this case the name isn’t always as it appears. Which imho, made hearing this women’s name it a delightful and unexpected choice. Thank you for doing a work up on this name. I’m glad to know more on the historical roots. I agree that Sophonisba — or any name — used as a family tradition can give a name greater appeal. Do you happen to know what the woman named Sophonisba after her grandmother was called by her friends and family — the full name, a shortening of it, or maybe even by her middle name? I’d also be interested in knowing how she pronounced the name: just as Abby has it here or more like Sophia for the first syllable of the name? It’s always interesting to learn more about historical names. She went by Cephie but her nieces and nephews and her full name by the family. I don’t like Sophonisba at all. Not the sound of the name or the original reference. If parents really love this name in itself — and not as a Sophia/Sophie alternative, then I could see using it. But if it’s really Sophia and/or Sophie the parents want — and plan to call her that most of the time, then why not just go with Sophia or Sophie? It’s such a beautiful name. I have a granddaughter Sophia, mostly called “Sophie”, who was born in 1995. I thought the name might be too old-fashioned when she was born; I very rarely heard the name on young girls at that time. Of course now Sophia is a top name, but even at that, I think it’s still very usable as is. I’ve sometimes called Sophie “Sophina”, an endearment I made up for her. So I’m surprised to read that Sophina is being used as a given name. Is it a “real” name? BNW’s namipedia says: “Sophina, An elaboration on the name Sophia… Sophina is not strictly a traditional name, but has been heard in various languages over the years.” Nordic Names says Sophina is a pet form of Sophia used in Sweden. I agree with British American that Sophina would be a preferable Sophia alternative to Sophonisba. But little Sophinas may end up being called mostly Sophie anyway. I see that I didn’t pick up on the “sah fon EES bah” pronunciation. That makes the name even more unwieldy because most people likely will see — and pronounce — this name as an elaboration of Sophie — soh fon IS bah is how I read it. This makes me wonder who a name is for — the bearer or the “truly daring namer” parents who “dare” to pick an eccentric name that draws attention to their “daring”? Is it a bad thing to be a daring namer? For many reasons, over many, many years, lots of parents have been drawn to names that are outside of the mainstream. I think it’ s a mistake to assume that they’re doing it for selfish reasons. I think because it’s an unfamiliar name, the 4 syllables strike me as too long. Which really shouldn’t be the case, when I do like other 4 syllable names. Perhaps because the -isba or -ba ending is uncommon too, it makes it sound “too much” to me. I also thought it sounded more like “So” at the beginning like Sophie, rather than “Sah”. I bet many people would mispronounce it. Also if the name relates to Ba’al that would be a definite dealbreaker for me, having recently been reading and teaching the Old Testament in kids Sunday School. Fun to read about a new-to-me name though. It would be a bold choice. I think there is a Sophina in my kids school. I prefer that as a Sophia alternative.